Just a really quick card and to tell everyone hi and to have a great weekend. 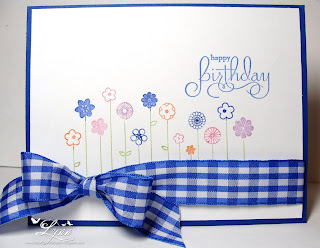 Take the Flower Garden stamp from Stampabilities, add Well Scripted from SU, some SU markers, card stock and ribbon and hey, we've got a card completed!!! Hope everyone has a fabulous weekend - and just a note to send my thoughts and prayers to all the families that have lost so much due to the recent storms. I've seen so many do this scrunched up ribbon technique and decided I just had to try it too! This is the same layout and basically the same card as I posted on Monday this week but I changed the paper, etc. (I actually like the one on Monday better!) But anyway, I made this one using some patterned paper from Paper Studio and it really changed the entire look of the card. Ok, now...we're on to the scrunched up ribbon stuff....My goodness, what a mess I had. I finally was able to get it looking good and left it on my desk until the next day to take a photo. Went back to the craft room the next day and the ribbon had flipped out all over the place...So, tried it again and this time not only used that sticky tape but also some glue! Great...now it's holding good. And then every time I'd look at it I'd see a GARTER BELT! You know, like the kind you used when, or if, you ever got married and threw to all the guys....that's what that scrunched up ribbon looks like to me!!! See what I mean! Now every time you look at a card with this ribbon technique, you're going to thing about my "garter belt card"! LOL! 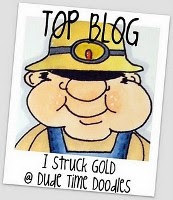 It's BLOG HOP time over at Dude Time Doodles! I can already tell you it'll be a load of fun with all the new release images you'll be seeing from Boni's STORE. There is so much inspiration from the Design Team - plus alot of fun, fun creations! The hop doesn't have a starting and ending point so no matter where you are, you're on the right path. Be sure and leave a little love at each stop because there will be winners announced and prizes to be had. In case you do happen to get lost along the way, here's a list of all the stops on the hop: Dude Time Doodles Blog, Anne, Cleota, Hetty, Boni, Lynn (that's me! 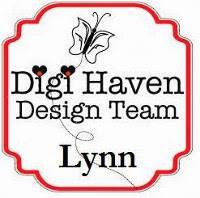 ), Tammy, Suzy who is our fabulous guest designer, Ginny, and Ruth! 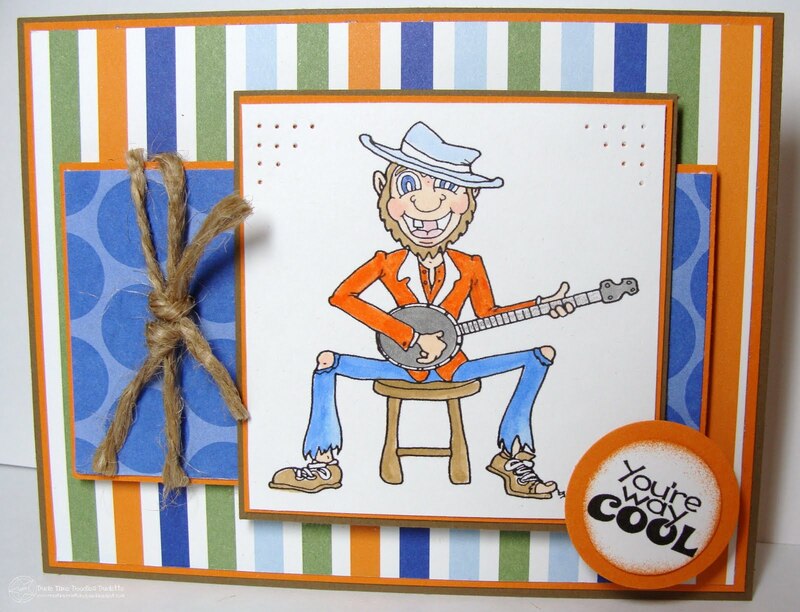 This wonderful new release image I'm using today is Cletus - and what a dude he is. It just really makes you want to kick up your heels and do a little dance! It reminds me of Dueling Banjos - but since there is only one banjo here I guess he's just "dueling" by himself! The sentiment is from TLC. 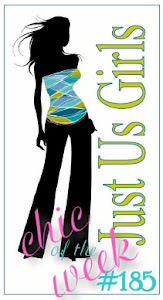 Be sure and check out this new release image from Boni's STORE and all the rest of the new releases. Your next stop on the hop is Tammy. 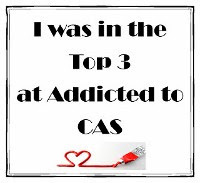 I have another CAS card for you today! 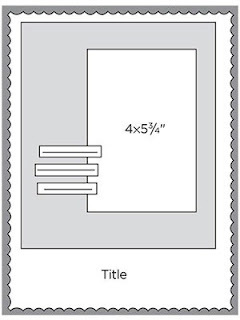 The challenge over at Friday Mashup is to make a square card, a black and white card, or mix them up and make it square and black and white. I didn't mix it up and just made a black and white card - but I just have to tell ya....it took every ounce of energy I had to NOT add some red or yellow or some color! I don't think I've ever made just one in black and white but do like how this one turned out. It's a fun challenge and really made me have to control myself and not add another color! It's also for the challenge at Mark's Finest Papers - an Anniversary card. It's their one year anniversary and I thought I'd help them celebrate today! The sketch I used was the challenge LAST week at The Paper Players. I didn't get this card done until today though so I missed their challenge but I do love the sketch. So I made another one using the same sketch that I'll be posting later. This sweet looking little girl doesn't have a name! I started to name her Sadie, as she reminds me on my daughter's youngest child. Sadie doesn't have brown hair though (she's totally blond) and if it was Sadie she'd probably be choking that poor bunny to death! So, she has no name - but is a very cute stamp from Eureka. I colored her with Prisma pencils and used several pastel shades of card stock. The DP is Pawistively from SU. I also added some Stickles on the little bunny tail. Other supplies I used were the Swiss Dots embossing folder, buttons, baker's twine, and ribbon! Whew....alot going on here! 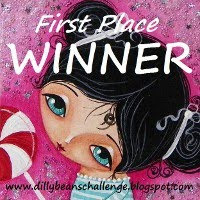 I'll be entering this in challenges over at Card Cupids (pastels), Catch the Bug Blog (inspired by Easter), and Karen's Doodles (lots of layers). Thanks for stopping by......and hope everyone has a wonderful weekend. Today is the third Wednesday of the month - which means it's time for the Inspirational Challenge over at DUDE TIME DOODLES! Use the inspirational photo to create a project and submit your creation. You're not required to use one of Boni's images (that you can find HERE) but, of course, it always makes us happy when you do. It MUST be a masculine themed project as Dude Time Doodles is all about the dudes!!! You have one week to link up your project and there will be a winner and top three announced then. 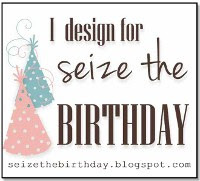 Be sure and check out all the other fabulous creations by the Design Team (you can find them listed on my side bar). Meet Earl Bunny - one of the fantastic images by Boni! He looks absolutely worn out and is already looking forward to that Santa suit at Christmas! My husband has never played the Easter bunny before but he did do Santa one year - and it was not a pretty sight! He's never weighed over about 160 pounds and even with pillow stuffing, it was sad looking! Thanks for stopping by......and check out Dude Time Doodles! Alot of bright bright yellow here so grab your Ray Bans and take a look! 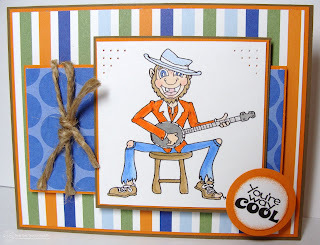 This started out as a CASE from a card on Connie's blog. 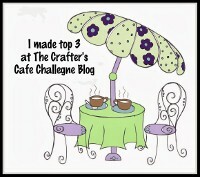 Check out her blog and you'll see wonderful creations daily! This BRIGHT yellow paper came from somewhere - but I don't know where. Sometimes I really think maybe my paper is just breeding overnight in my craft room! Does anyone else have that same problem???? 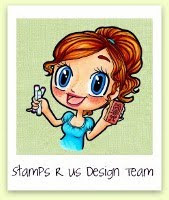 It's a new challenge over at Stamps R Us and the theme is "bugs and embossing"! Now, technically, a bee is not a bug......however, you get the message here anyway. 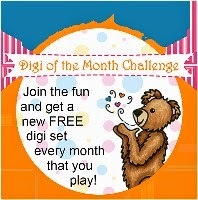 Come on over to Stamps R Us and play along with the challenge. You have two weeks to enter your submission! 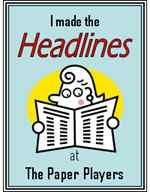 We are sponsored by The Doodle Pantry and there is a PRIZE up for grabs - plus badges for the top winners. This little bee image is just one of many wonderful images you'll find at The Doodle Pantry. 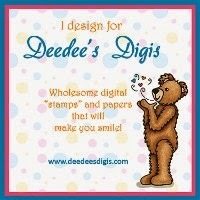 While you're at the Stamps R Us challenge site, be sure and check out all the wonderful cards by the other DT members. I hadn't made a baby type card is like forever....so thought I'd do that today! I used some Marina Mist, Tangerine Tango, and Crumb Cake and since it makes a pretty bright card for a little baby, toned it down some by adding the organza and then the satin ribbon. The stamp set is called Choo-Choo from SU. After cutting out the little train cars I popped them up on dimensionals. Even though you can't tell it without clicking to get a bigger picture, I used a SU texturz plate on the background blue. Those texturz plates really give the card a nice look in real life, but don't always show very well in a photo - or maybe I should just say in MY photos! 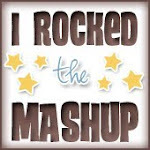 This is for the challenge over at Friday Mashup. It's a sketch challenge and/or a color challenge. Love this sketch and I know I'll be using is again and again. 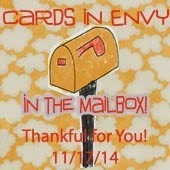 Check out their challenge today and be inspired by all the wonderful cards from the DT. If you'll remember several weeks ago I used this same wonderful image with an entirely different layout, etc. I'm really liking this one so much better. We always have a big garden but have never really had a herb garden for some reason. I think I tried it one year and then forgot to get the herbs when cooking - and that was the whole purpose of planting it! Oh well...I guess it's just best to stick with a herb garden on a card instead! Again, I colored the image with my Prisma pencils. This image and sentiment is a VERY old one from SU called Sweet Herbs. I like the lace on this with the filigree brad in the center as it gives it a different look. 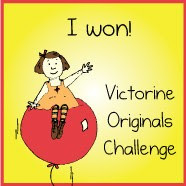 This will be for several challenges: Stampin Royalty (Spring), and Art Impressions (anything goes). Hope everyone is having a very happy Wednesday! 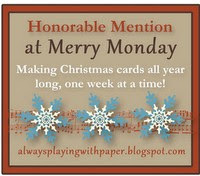 This is going to be a fairly short post but wanted to show you my card for today. It's actually a CASE of one I saw on Lucy's blog. 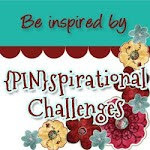 Check out her wonderful blog and be inspired. The stamp is from Indadinkado and is probably older than me! Not really, as there's not too much older than that!!! I colored a few of the flowers and added a couple of those tiny little pearls from SU. I stamped the image twice and popped up the bird. The patterned paper is from the Basic Grey Porcelain Paper Pad. This will be an Anniversary card that I will need later in the month for a very special couple. 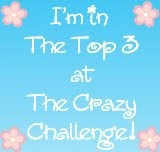 Ill be entering this in the Oldie But Goodie challenge (wedding or anniversary theme). The challenge over at Art Impressions this week is to use black, blue, and tan. Those colors just scream MALE to me.....hence, this masculine looking card. The boot image is from Kitchen Sink Stamps - love those "step" images they have and am slowly getting the hang of them. I used a texturz plate from SU on the tan/brownish background. Those are good when you don't want a really deep impression. The rest of the card is pretty self explanatory. 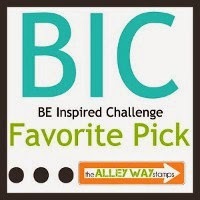 The sketch is from Totally Papercrafts for their challenge this week also. On Saturday I attempted to post a note about all the wonderful blog awards I'd recently received but Blogger was just not wanting me to do anything that day and the post kept getting totally messed up! SO, thought I'd just mention all these wonderful ladies (and one gent) that had passed on an award to me....thank yall so much - Connie, Kevin, Lesley, Monica, Jo-Jo, Christy, and Kathy. (If I've left anyone out, I apologize). 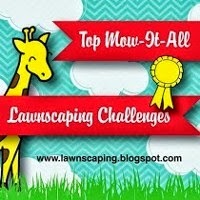 If you get a chance be sure and check out their wonderful blogs. Also, before I forget, you still have one week (almost) to enter the Easter theme challenge over at Stamps R Us! 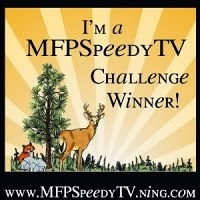 Pop over there and submit an entry! Just like last year I'm afraid, we're in drought conditions around here in Texas again. I don't even remember what rain looks like, smells like, or what it does! I'm really thinking that the last time we had any type of measurable rain was back in maybe September of last year! Now this is NOT good. If you have grass - it's not green. There are hardly any wildflowers this year and usually the countryside is just filled with them. Even the barn swallows are having trouble building their little mud type nests - as there is no mud! This is for several challenges this week: House Mouse Challenge (the sketch I used - and I'm really liking it alot! 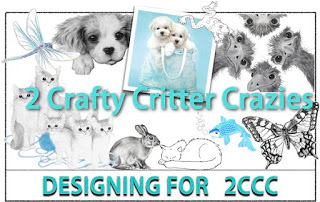 ), Crafty Creations Challenges (rain/showers), Fresh Brewed Designs (flowers) and Sassy Studio Designs (April showers with something wet or watery added (liquid pearls)). 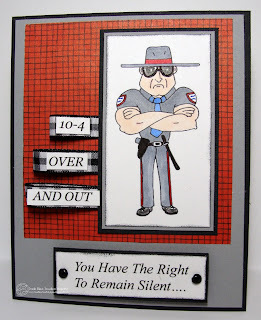 Today I'd like to introduce you to Super Trooper Tripp - another fabulous image by Boni that can be found at the Dude Time Doodles Shop! Pop over there and check him out along with all of her other wonderful images. Today is ALSO the first Wednesday of the month and that means it's the Sketch Time challenge over at Dude Time Doodles!!! 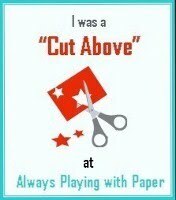 Our sponsor for this challenge is the Paper Temptress! Ok, now like I said it's a sketch challenge and there are a couple of rules you need to follow. You have one week to flip the sketch, twist the sketch, work the sketch, and submit your project. You're not required to use a Bonibleaux image although it'd make us happy if you did. It MUST be a masculine type project - as this is all about the Dudes! Be sure and check out all the DT members projects for some wonderful inspiration. 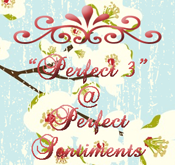 Our Guest Designer for April is Suzy and I just know you'll love her creations too! 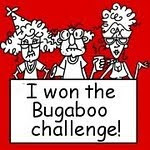 So head over to Dude Time Doodles today and enter the sketch challenge. 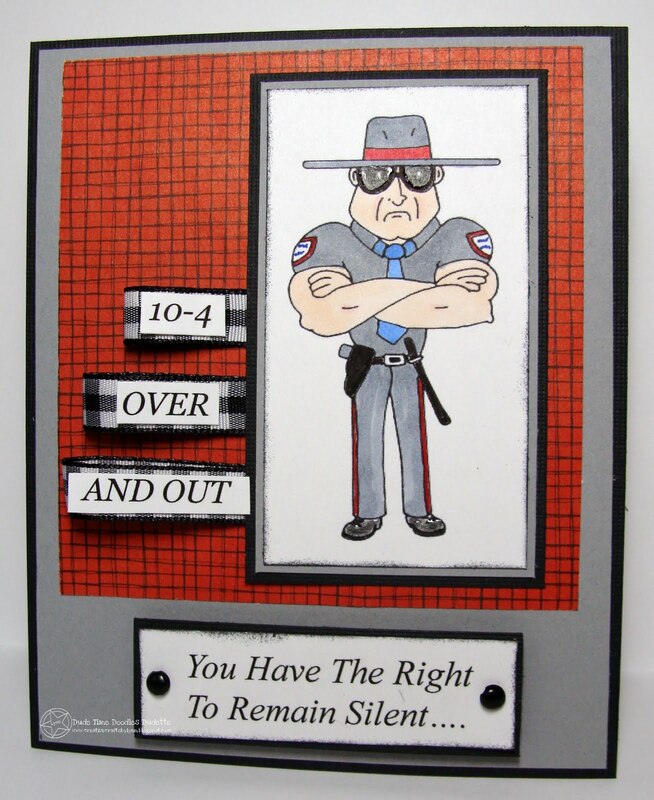 Now on to the Super Trooper.....Hopefully none of you have had any kind of a "run-in" with this type lately. He really does look like he'd just give you a speeding ticket "because"! The sentiment is computer generated and on the inside it says "About your age". He'll make a great Birthday card for a special dude! I added pieces of black and white gingham ribbon on the sides and then printed out "10-4 over and out" and adhered that on top of the ribbon. Thanks for stopping by..........and be SURE and head over to Dude Time Doodles and enter your masculine card today using this wonderful sketch! Another CAS card today but I like this one SO MUCH BETTER! In fact, I may just send it to myself! I'm not real sure if it's the image, the pink, or the bow..but whatever, I'm leaning toward liking this one. 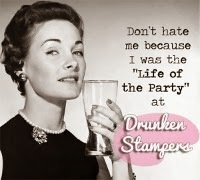 It seems like lately I'm not liking anything I do....but I guess we all go through that from time to time. This image is from a Hero Arts set called Pots, Plants, and Posies. It was one of the stamp sets that I received from my friend Kristin! It also has some other wonderful images in the set and I'll be using those soon. 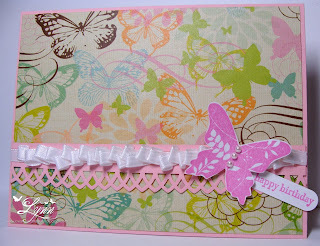 I used some Green Galore and Pretty in Pink CS from SU and embossed the pink with the Birds and Swirls embossing folder. 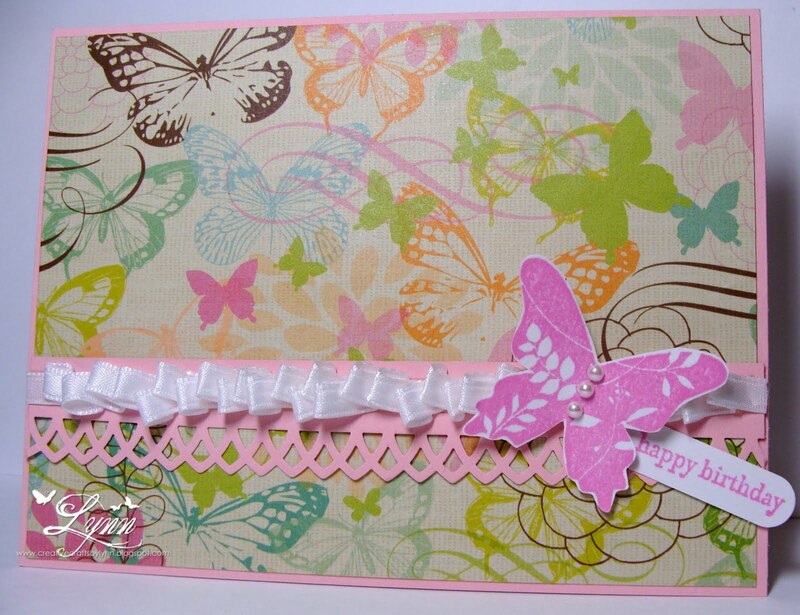 The ribbon is Pink Pirouette and the bow was completed using that fantastic little tool - the Bow Easy! The image has been colored with SU markers and Prisma Pencils. Sorry I forgot to give everyone an update on this past weekend with the new granddaughter. She's just the cutest little baby you've ever seen - OF COURSE! I did get to spend alot of time holding and hugging so it turned out to be a wonderful weekend. Hubby bar-b-qued a brisket that was out of this world and we had very nice weather - although a tad bit warm. So all in all it was a great weekend. 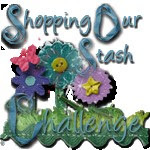 This is for the following challenges: Corrosive Challenge (use Pastel colors) and Creative Inspirtations Paint (inspired by Spring), and Hand Stamped Sentiments (pink). What can I say..sometimes I just feel like I must be lazy! LOL! 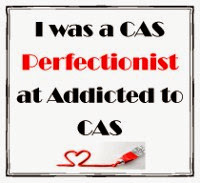 Even though this is a very simply CAS card, ever so often you just need those! I mean...we've got a cute image (Stampabilities), nice ribbon, so-so coloring....and viola...it's done! It still makes a really cute little card for Easter. 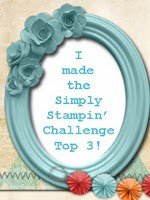 Stamps R Us Challenges begins another two week challenge today and the theme is "Easter". Our sponsor is The Stamp Fairy (such cute little images) and you could win some playing along with the challenge - so hop over there today and add your Easter card or project! 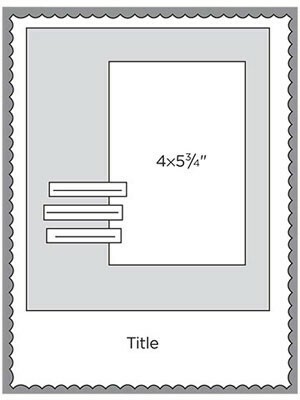 And prepare to be inspired by the rest of the Design Team! Easter will be here before we know it. I really don't send out but a couple of Easter cards every year, but I do enjoy making them. Aren't these just the cutest little birds! 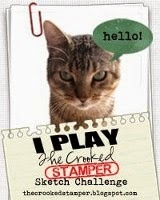 I found out how to do them over at Jean's blog - Stampin Cos It's Fun. Of course I like her card better than mine but at least I found out how to make these cute little critters. Check out her card and instructions, but basically you use a 3/4 inch punch, and the Bird punch from SU. I hand drew the feet and just made the beaks and eyes with "whatever"! The sentiment is from Well Scripted (SU). Let's see....I also used the Square Lattice die, some Nesties, the Bow-Easy, and ribbon. 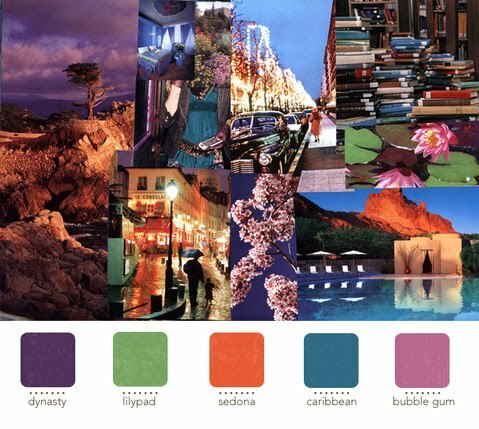 The paper I used was Pacific Point (again), Bashful Blue, White, and some unknown DP. This is for the challenge over at Skipping Stones Design....sketch. 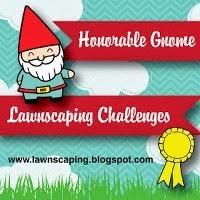 Be sure and check it out if you get a chance. While you're reading this, I'll be cuddling my new granddaughter, Madeline! My son and his wife had Madeline in February and this will be the first chance I've had to see her! I'm very excited about this - as if you couldn't tell! Hope everyone is having a nice weekend and I'll be back on Monday. Oh and one last comment here.............Today is BONI BOUTELLE'S BIRTHDAY!!!!! Happy Birthday Boni! Boni is the head honcho over at Dude Time Doodles. She has wonderful images and just is a joy to work with.